If you find yourself in the strange age right after your whole education has ended, you have worked for several years and have a trusted partner (or maybe not entirely) and a large family that will be soon expecting from you to grant them with a heir… well, it is basically what happens to everyone in our modern society. But we tend to have so much stress about time and finances that the last thing we want to hear is “My dear, when are you going to settle down and have a child yourself?”. All of you in the community are very active people with various backgrounds and probably have a hundred ideas a day about what and when to do and barely find time to visit your relatives. Let alone having another one sitting on your lap, constantly seeking your attention and exhausting your energy. It sounds rather scary when you think about it. In fact, modern society describes the life of having a baby as a period of restrictions, sleeplessness and constant pressure which could fit in a story named “Here comes the baby! End of life”. Alpine summit in Feb 2018. Don’t calm down and relax in your seats because the reality is not entirely different. The truth is, though, they never tell you how to take care of a baby so that you experience less of these inconveniences. 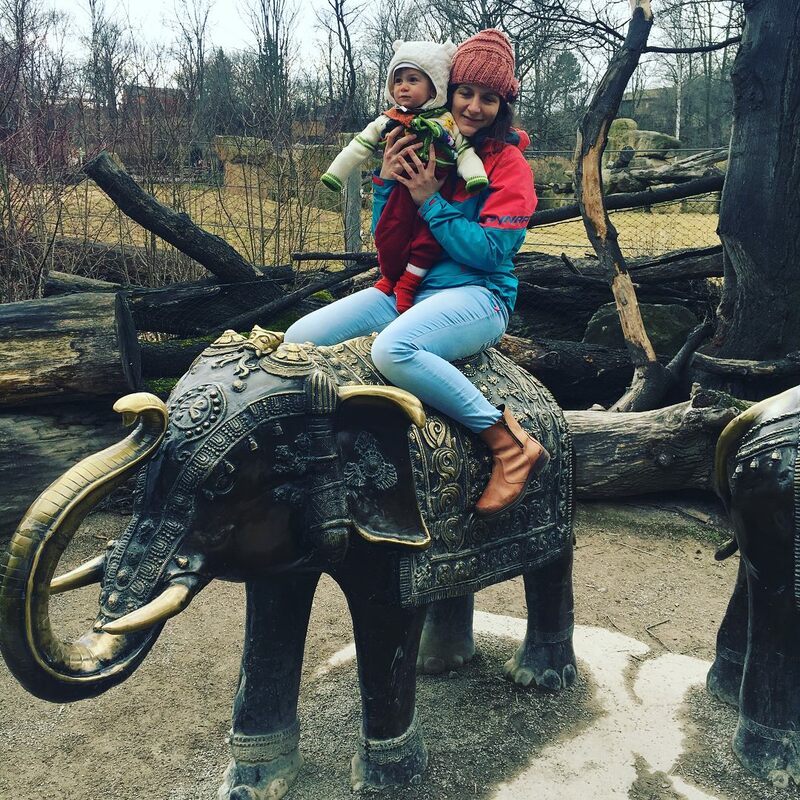 Life with a baby can also be pleasurable and adventurous! And even though all mothers have hundreds of adventures every day trying to save the life of their children from a speeding car, falling objects, deep water and whatever you may think of (I bet there is nothing else in the world that accelerates the rush of your blood so efficiently and quickly), there are numerous things you could do with a baby outside. In fact, I have only had a baby for one year but it has been the most intensive year I remember. Babies develop incredibly fast in this period of time. Every day is a different story, so adjusting to something doesn’t work. Flexibility is the key. 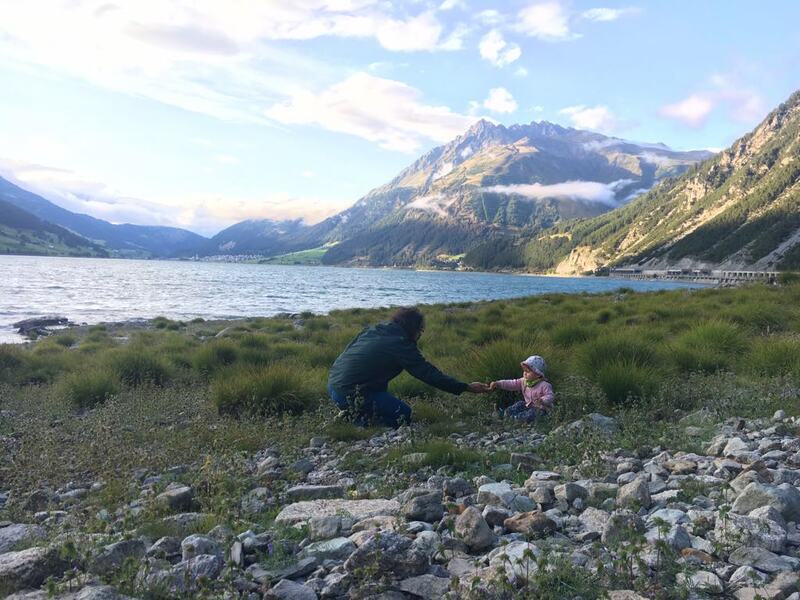 I got pregnant during an adventures in one of the most beautiful countries in the world, Georgia, while visiting my boyfriend who was on a world cycling trip. It was a very exciting summer two years ago, filled with thrilling experiences such as paragliding, climbing, water sports etc. I was also soon to start my Master degree studies of Product Service System Design in Milan and felt free and happy (which is apparently very important for the uterus for conceiving a child). So to speak, the circumstances were not the right ones but who says what is right and what is not? On the first day of school I had my positive pregnancy results and life changed forever. Now every choice that I make is tied to the life of my adorable daughter but something very important to keep in mind (and you must remember it very well) is to never change your life because of the appearance of a baby. She needs you to be happy and active and doing what you love in order to see that the world is a beautiful place to be born in. 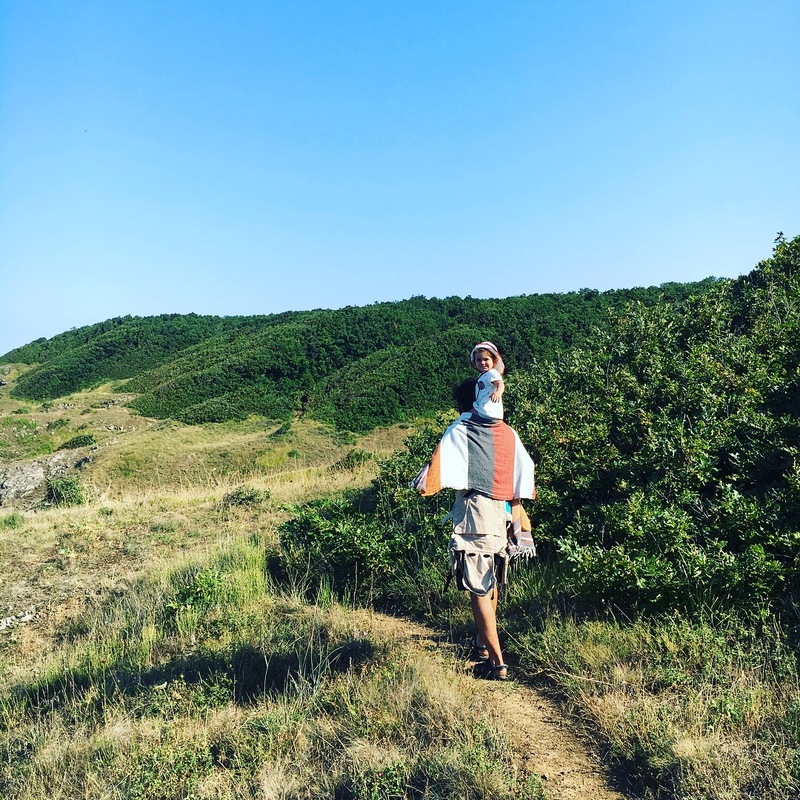 This is hard to be implemented in practice because our world is not made for babies and children to hang around while we do our work or go skiing or climbing, but there are always ways to go around these obstacles. 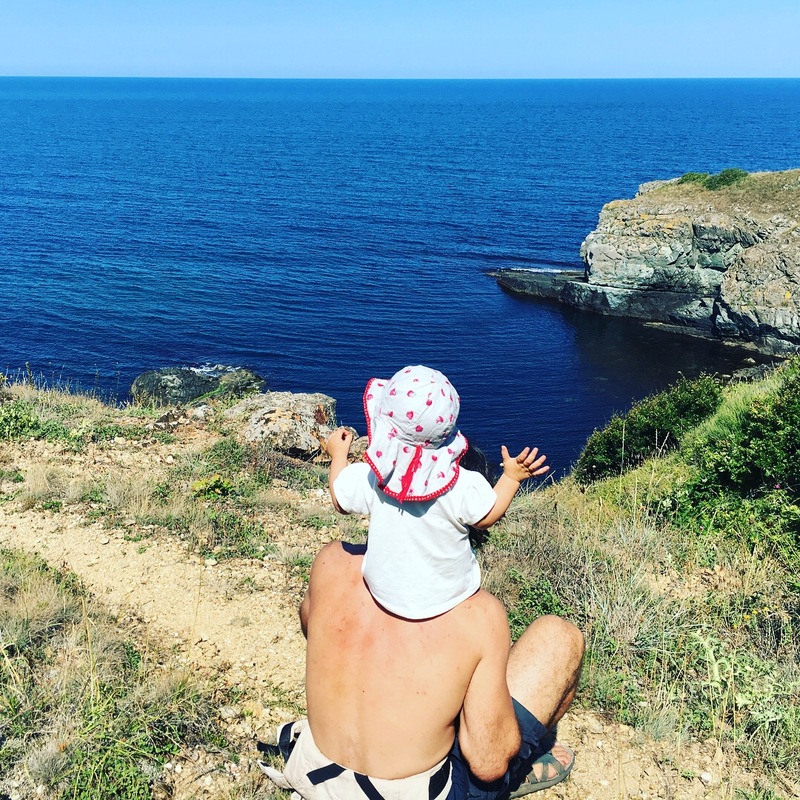 The mind of a baby is greater than a scientist’s and needs constant adventures to develop and feel in content with the surrounding environment. They need to discover and look at, touch, drop, throw things to see how they behave. Also, they are never so happy as when they spend their time outside being carried by their mother (or father). There are many psychological aspects of their development related with this in-arms experience and research shows that this is a great prerequisite for leading a full and happy life as an adult later. 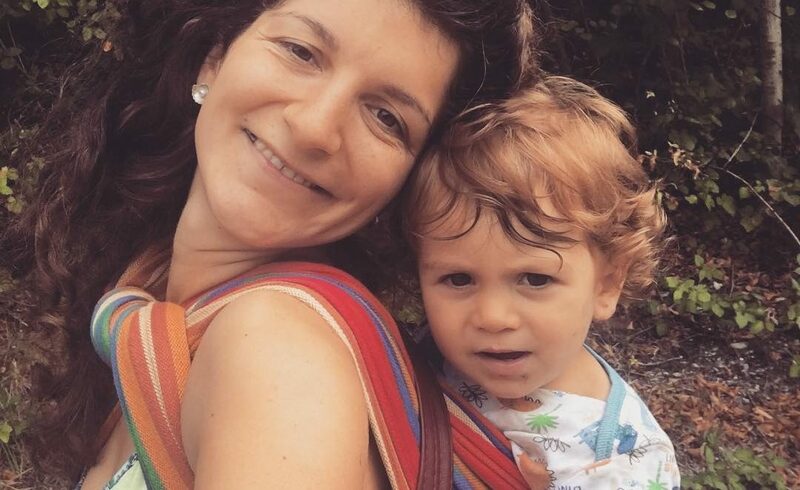 The first days after our little baby Raya* was born were sunny and wonderful and I couldn’t imagine having to stay indoors right after spending four days in the hospital without being outside. In many countries people consider it dangerous for newborns to be exposed to sunlight, wind and the viruses and bacteria in natural air before the 40th day after birth. Well, they are certainly not wrong, but when the baby is breastfed and carried close to their mom’s body it can basically survive a climb to the top of Everest. This is a bit exaggerated but the truth is that babies are incredibly strong and calm creatures when they sleep in the carrier and listen to the sound of nature. This is what babies did thousands of years ago and one has to ask himself, why would it be different now? 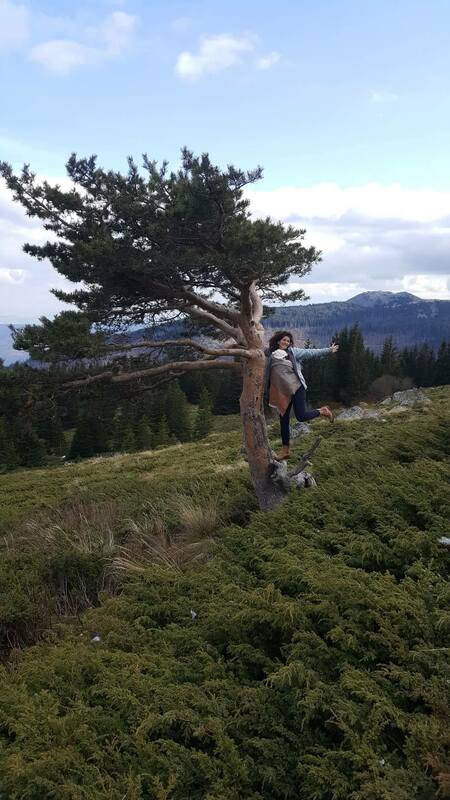 So we had some short mountain hikes with Raya and started to plan some longer trips for the summer. 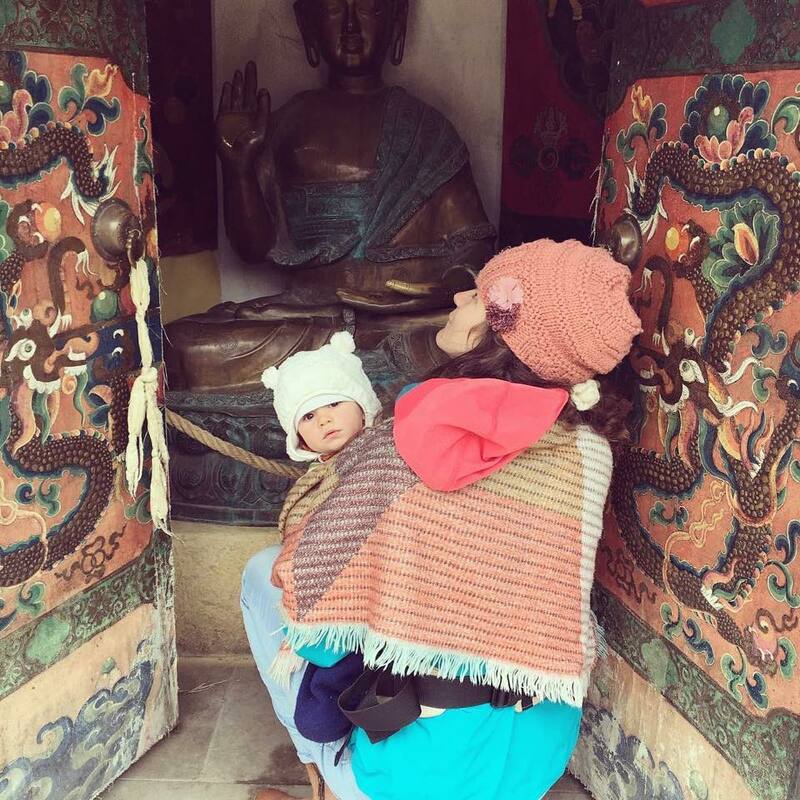 As any mother, I had a very strong feeling for protection and was sceptic about how a roadtrip with a newborn would work out. Moreover, research in Internet showed almost nobody did that. My boyfriend said we could always be the first to try (I doubt we were :)) but I didn’t like the idea very much until we actually went camping and rock climbing in Ötztal (South Austria) and Finale Ligure (North Italy). Raya hated the car but she loved every bit of the outdoor experiences and sleeping in the tent with the fresh air was just perfect for her. We had a third person with us so we could take turns carrying the baby and climbing and belaying but even with two partners it would work. 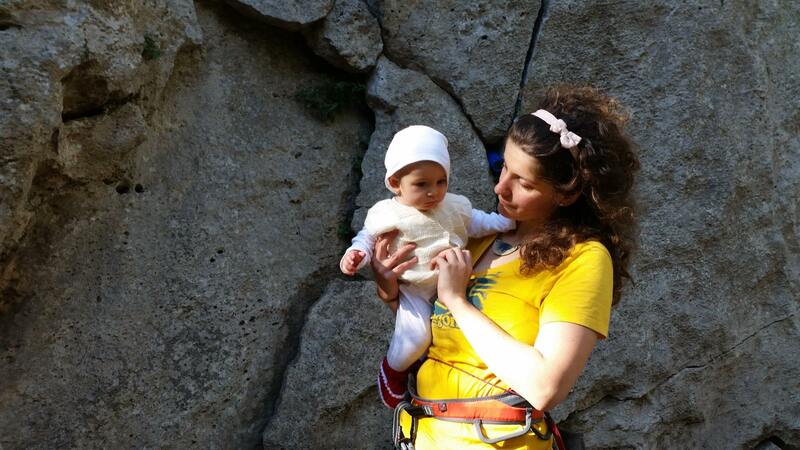 It is dangerous to climb with a baby in a carrier but if it is an often-climbed route, cleaned from unstable rocks and the baby is carried on the back of the belayer, it would be just fine. We had a lot of climbing-related trips like these throughout the year. 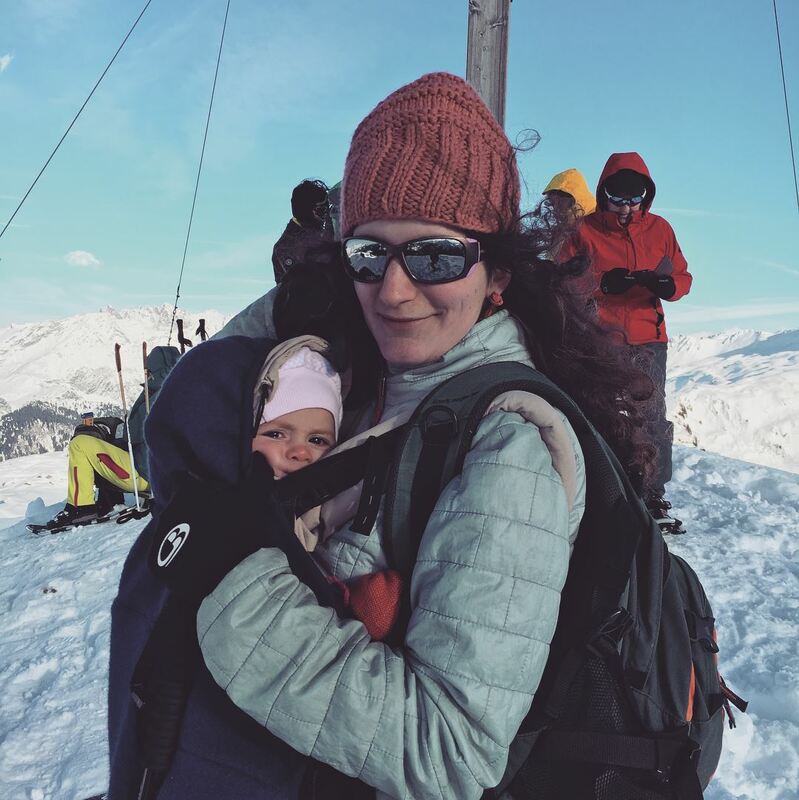 In the winter we even went hiking up in the snowy mountains and sledding with Raya when she was 8-10 months old. 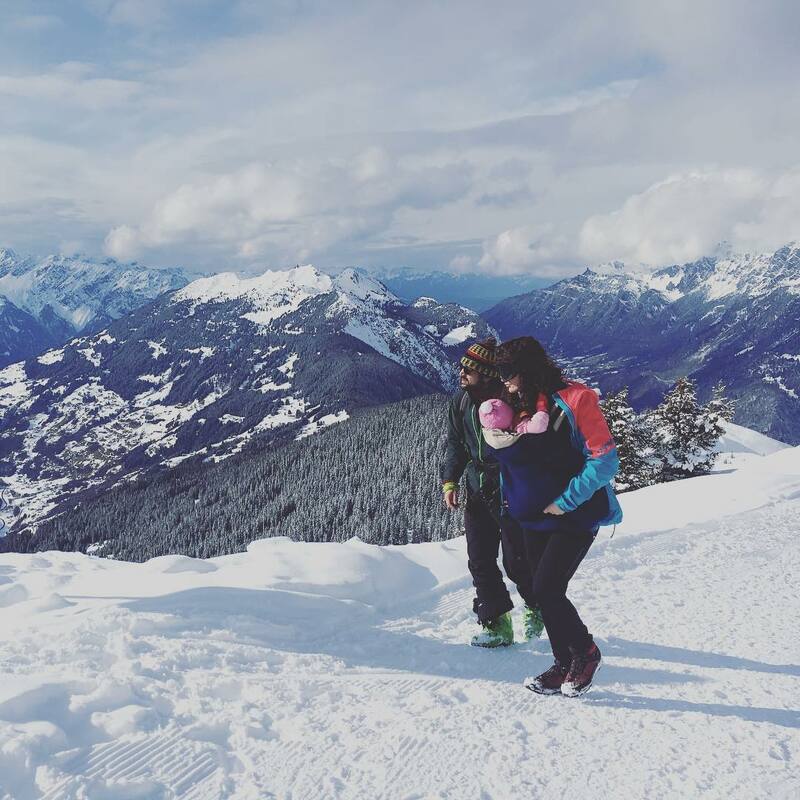 We climbed our first winter peak with her in the baby carrier on a sunny February day and had numerous smaller hikes in the close mountains (we live in Bludenz, Austria). One day Raya’s dad took her skiing on his back but pretend you don’t know about this. I am not so sure babies have to go skiing. 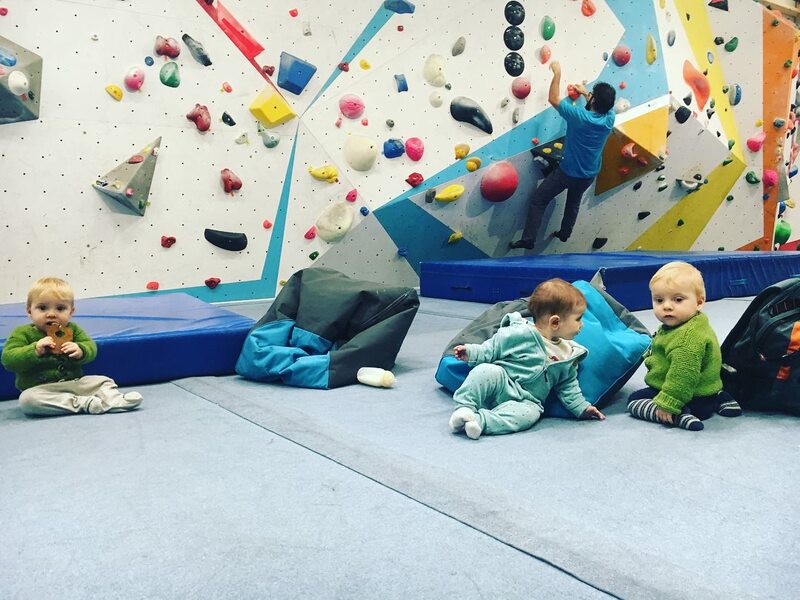 On bad-weather days we spent our time in the boulder hall which is, by my experience, the most baby-friendly sports facility of all kinds. It has the softest floor so falling is not dangerous anymore. Just make sure you pick the right hours when crowds are gone. Spring came and Raya grew up a little so she was more demanding of moving around, started crawling and investigating on her own. It became more and more difficult to carry her and ask her to stay still. She is not the kind of baby that would sit around and do nothing. She is always on a mission and it is hard to find the balance of what to permit and what not to. Too many restrictions make babies nervous and eventually they become disobedient or full of self-doubt. No restrictions make them chaotic and disrespectful. It takes a lot of understanding of their nature to know how to react and parents must be aware of everything they do themselves. As a general rule, a baby wouldn’t follow their words, it would only imitate their actions. This is how it is and there’s nothing we can change about it. This is why they learn so fast. Another great thing to do no matter the season (in most countries) is swimming. Swimming is especially easy to do with a baby because they naturally love water. They used to live in water for 9 months before birth so there is no other more familiar environment for them. The baby would feel comfortable only if you start taking her to a swimming pool or a trusted water source early – in the first months after her appearance. Experts even organise swimming courses for babies so that they learn how to behave in deep water. Before arriving in our world they could drink the water and they would never drown, but now they use their lungs for breathing and have to keep them dry and working. So, the courses are very useful for people who have a swimming pool or a pond in their yard or just spend a lot of time around water with their babies. We started when Raya was 5 months old and in the winter we visited a lot of pools filled with thermal water which is actually warmer (around 30° Celsius) and the baby felt good even outside. Now, during summer we are around water all the time. There are plenty of other experiences parents with babies can have together. 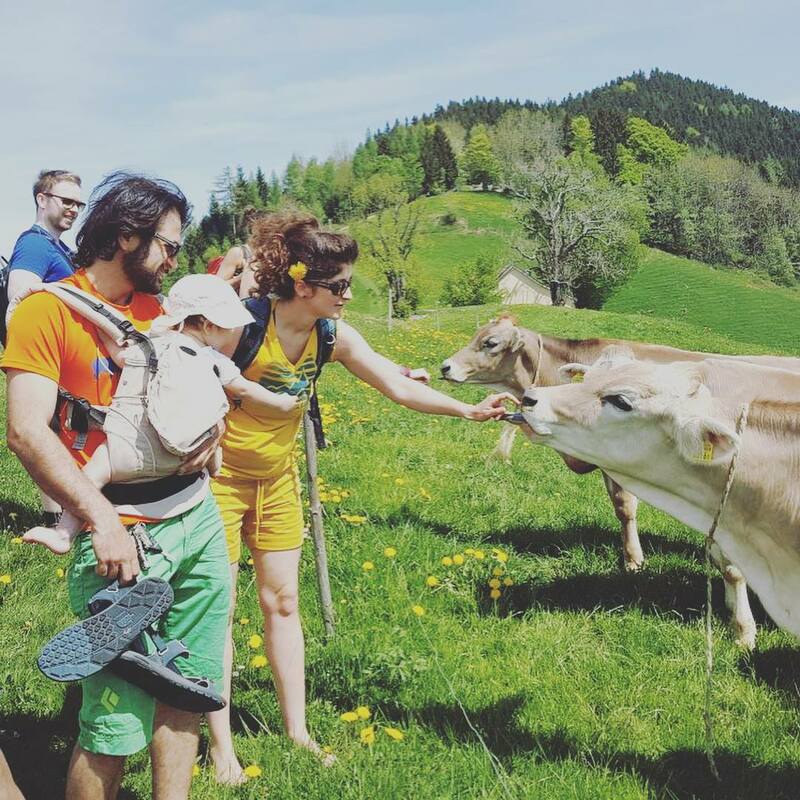 Sometimes it is even easier to organise a trip when the baby is younger because it requires almost nothing extra for you to carry. They would sit still and sleep a lot so there is more opportunity for the parents to engage in fun but safe experiences. And since everyone has a different idea of “safe” , I would leave this to you to decide on your own. The only thing to take into consideration when travelling is feeding the baby and I would of course vote for breastfeeding. 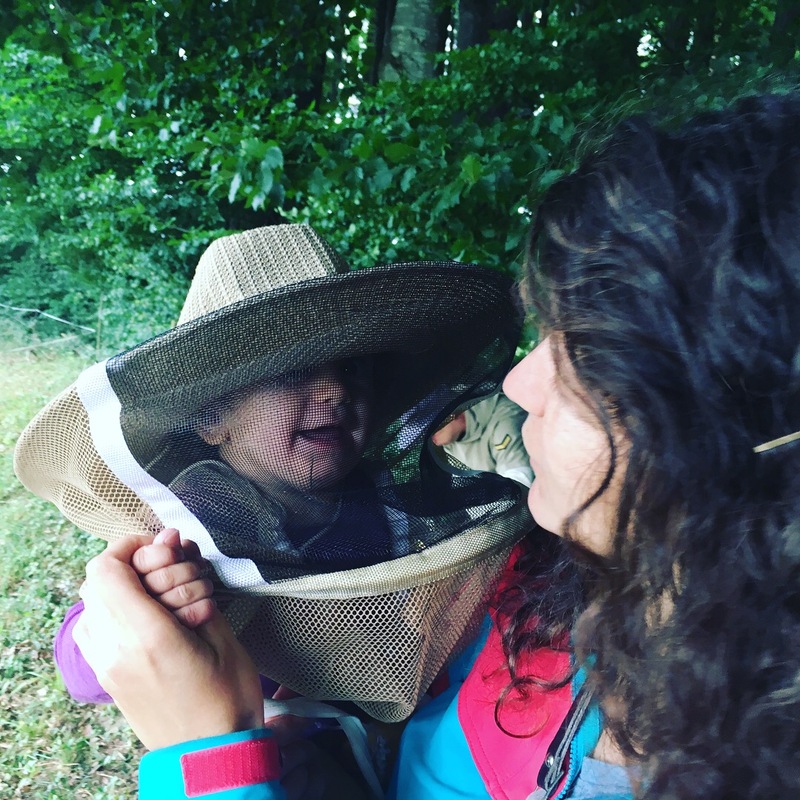 If parents decide to take care of their infant in a natural way they could travel much more than if they pick the newly methods for babycaring. I won’t go deep into this but just wanted to say that everything we experienced is only possible because Raya is a breastfed baby and now eats normal human food. I almost never have to take something special for her. It might sound like a detail but believe me – baby’s food is really an essential matter when you make plans for travels! The thing that drives me the most as a new parent who has to make decisions for my baby’s life is the thought of how people used to do it hundreds of years ago. Did they actually stay home? No, not at all. Did they put their babies in separate rooms and left them to cry all the time? Of course not. Did they give them some ready-made substances to feed them? Absurd…Well this Q&A can go on forever but my point is – there is nothing more natural for a living creature than continuing Life and we just have to believe in ourselves and trust our intuition. We could have an enriching and beautiful experience of parenting with all of its ups and downs, coming and going one after the other. I hope my words felt inspiring for some, for others maybe a little alien, but parenting is another chapter of our book of Life and we should also share knowledge about it.. One last thing: Love what you do, love the people around you and most importantly, love yourself. There is nothing more inspiring for a baby. As for me, I will go cuddle with Raya and next March, we both go back to university so that I finish my Master degree. 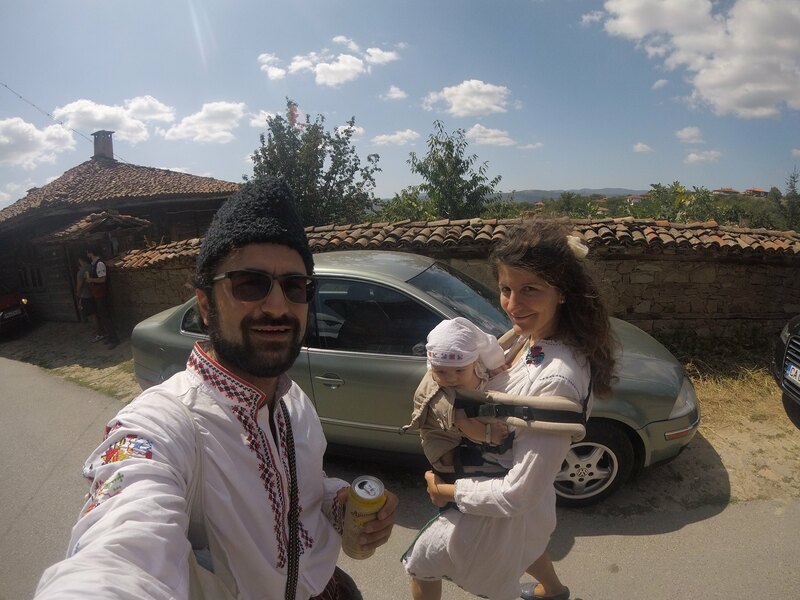 *Raya comes from Rayko, Raytscho – the name with which the Bulgarian people called the holy Sun back in the days before the Orthodox church put a veil on the original traditions. It is still found in the folklore.